The Snoqualmie Valley Trail offers the opportunity to get out, in any season, and explore one of the most beautiful valleys in the region. The trail parallels the Snoqualmie River and occupies the historic path of a spur line of the Chicago, Milwaukee, St. Paul & Pacific Railroad. 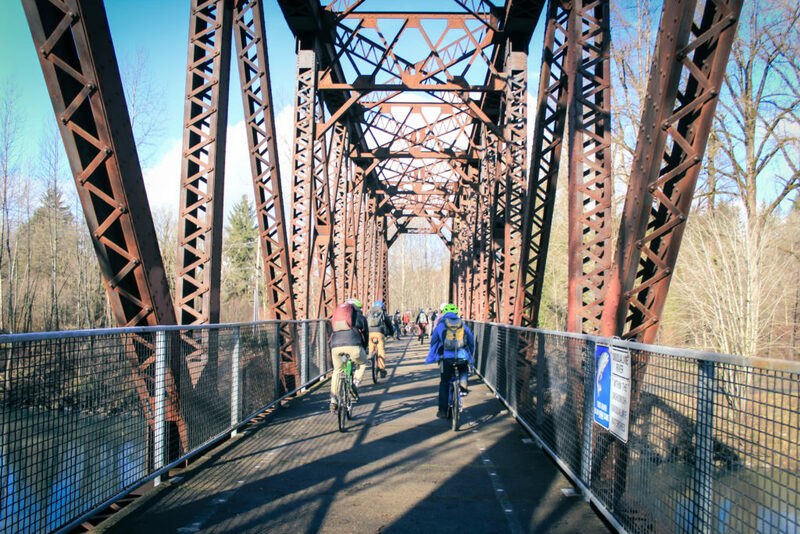 At 31 miles in length, the Snoqualmie Valley Trail is the longest regional trail in King County. This itinerary takes you from Rattlesnake Lake to Snoqualmie, a 10-mile one-way bike ride. It also connects you to the historic downtowns and parks along the way to make the most of your day trip. Use our Snoqualmie Valley Trail map as you navigate throughout your adventure. To do a one-way bike ride, you’ll want to park one car in Snoqualmie. Head to Reinig Bridge, just a few minutes from downtown. There’s a little pull off next to the bridge and a set of stairs. If you need to grab anything before you start your journey, you can find what you need in Snoqualmie or North Bend. Next, drive southeast to the Cedar Falls Trailhead, you’ll need a discover pass to park here. Before you start on your journey you should take a few minutes to enjoy the beautiful Rattlesnake Lake that is just across the street. If you want to spend a little more time in the area, you can visit the Cedar River Watershed Education Center, which is just a few minutes further down the road. Their Rain Drum Installation alone is worth the visit. Once you’re ready to head off on your bikes, you’ll find the Snoqualmie Valley Trail just next to where you’ve parked. Be sure to head to the left (north) towards North Bend. After about a mile you’ll see a sign for the Cedar Butte Trail. This trail will take you past the site of the “Boxley Blowout,” a 1918 power dam failure that destroyed the logging community of Edgewick. You can read about it on our blog, The Town that was Swept Away. Continuing on the Snoqualmie Valley Trail you’ll soon pass over the South Fork of the Snoqualmie River. This fork of the Snoqualmie has it’s head waters at Alpentol at Snoqualmie Pass. Soon after the river, you’ll go under I-90 and head into North Bend. Just after you cross North Bend Way you’ll arrive at Tanner Landing Park, a King County Natural Area on the banks of the Middle Fork Snoqualmie River. This is a nice place to take a little break and enjoy the view. There’s also a toilet just a short distance from the parking area. Herds of elk are often spotted hanging out here or crossing the river. Continuing north you’ll soon cross the Mt Si road. Just down this road is the Little Si Trailhead, which also has a toilet. Below Little Si, is Mount Si, and Mount Teneriffe. Recently the Department of Natural Resources built trails to connect all three peaks. Continuing on the Snoqualmie Valley Trail for another mile you’ll reach downtown North Bend. Just before that, you’ll arrive at Torguson Park, a large City park that has lots of amenities, including a climbing wall. After Torgusen you’ll reach Ballarat Ave and see a blue wayfinding sign that points to Historic Downtown North Bend and also shows you the mileage to the neighboring cities. You can follow the sign to downtown North Bend and find something yummy to eat or drink. Check out our Locals’ Guide, voted on by residents, for some ideas of where to go. Once you’re ready to continue on, head back to the Snoqualmie Valley Trail and continue on north towards Snoqualmie. In less than 2,000 feet you’ll cross the South Fork Snoqualmie River (again) and just beyond that you’ll cross over Ribary Creek. To the left you’ll see Tollgate Farm Park. This farm is one of the most important historic sites in the Valley. You can read about its history on page 24 of this City document. Soon there will be a trail connecting the Snoqualmie Valley Trail to Tollgate Farm Park. Continuing north, you’ll soon arrive at another historic farm, Meadowbrook Farm. This is another important farm, one that once held the title of “largest hop farm in the world”. Soon their will be a trail connecting this farm as well. We’ve put together an itinerary for this farm called A Walk at Meadowbrook Farm. After Meadowbrook, you’ll soon pass through the Mt Si Golf Course and into Three Forks Natural Area, where you’ll ride by Meadowbrook Slough, an important wetland for birds and amphibians. Continuing on another couple thousand feet and you will arrive back at the Reinig bridge, and your car. If you hadn’t had a chance to check out Historic Downtown Snoqualmie now is a great time, it is a beautiful city, with lots of things to look at as you walk around. Don’t forget to get your other car as well!